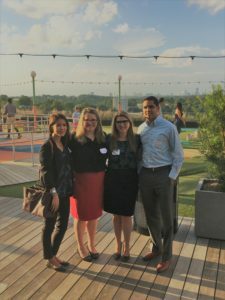 Thank you GLQC for a great opportunity to get to know your members while enjoying the roof top at Ponce City Market! Attorneys from KPPB LAW’s commercial real estate staff (pictured from left to right), Alice Wei, Nichole Roche, Alyson Markovich and Samir Patel taking in the city skyline. The Georgia Lenders Quality Circle (GLQC) is a non-profit association for banks, non-bank lenders, certified development companies, and other professionals, and service providers that are active in the origination, support, management, and liquidation of government guaranteed small business loans. The association seeks to provide a forum for its membership to exchange ideas, information, and insight with each other, development companies, agency officials, and the associate members in order to strengthen the industry, and promote a better environment in which to operate and prosper.